Southern Combo Doubles is the fastest growing adult league program in the South! Both men and women's teams compete at the state level to advance to the Southern Combo Doubles Southern Sectional. Tennis action takes place at The Peninsula, The Beach Club, Gulf Shores Plantation and The Cities of Gulf Shores and Orange Beach. Stay with a Team that’s Dedicated to Your’s and SAVE 25% on your stay! Use Code: KAISERSPORTS20 to secure your accommodations through our easy online booking process. From one bedrooms condos to homes accommodations up to 42 people with ease, find your perfect property with Kaiser Realty by Wyndham Vacation Rentals today. Rate Restrictions: Rates are subject to availability. Certain restrictions, taxes and fees may apply. Two night minimum stay for condo rentals. Four night minimum stay for houses. Not valid with any other specials or online incentives; cannot be used in conjunction with any other offers. Special rates do not apply to previously booked reservations and valid only in properties participating in promos. You only live once, but you get to serve twice! 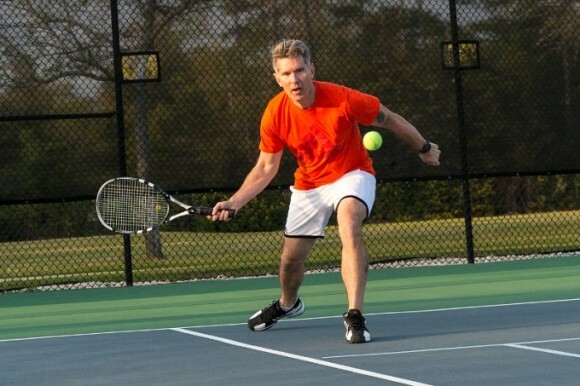 It is our pleasure to welcome all Tennis Stars to our beautiful beaches of the Alabama Gulf Coast. Located directly on the beach, all of our spacious guest rooms feature a private balcony, mini fridge, microwave, Keurig coffee maker, iron, ironing board, and hair dryer, complimentary wired/wireless high speed internet, indoor/outdoor pool, 2 whirlpools, guest laundry facilities, 24 hour complimentary business center, and onsite fitness center. Rates are subject to rooms (standard inland with 1 king bed or 2 queen beds) availability and taxes. When making reservations ask for Group Code “SCR” or book your entire team online by clicking the link below. Contact Group Sales at hotel with questions. We're having fun at the Holiday Inn Express Orange Beach and it is our pleasure to welcome all Tennis Champs to the beautiful waters of Alabama Gulf Coast beaches. Located directly on the beach, all of our spacious guest rooms feature a private balcony, mini fridge, microwave, Keurig coffee maker, iron, ironing board, and hair dryer, complimentary wired/wireless high speed internet. We also have an outdoor pool, whirlpool, guest laundry facilities, 24 hour complimentary business center, onsite fitness center and beachfront poolside bar (seasonal) When making reservations ask for Corporate Code 100224694. For groups of 10 or more, contact the Sales Manager, Leslie Haley at the hotel directly at 251-974-1634 or you can e-mail at [email protected] for the best rates and availability. Earn IHG Business Rewards Points! Earn 3 points per $1 spent within a group or meeting booking with no minimum qualifying spend to earn points! Please visit holidayinnexpressorangebeach.com or call 1-800-HOLIDAY and book. Rates Starting at $152 Enjoy the experience of a life time at the islands only Full-Service Hilton Hotel! From sitting on your private balcony over looking the sugar white sand and turquoise waters of the Gulf of Mexico to dining at our Full-Service restaurant. We provide Luxury in paradise, with our award winning culinary team and our touch of genuine southern hospitality. Join us in paradise and let's create memories that will last a lifetime!! !